A lush green and healthy looking lawn adds a lot to the beauty of your house. Who doesn’t want their garden to look flawless throughout the year? Once you have designed and created the ideal yard space, the question that arises is how to keep your lawn looking its best year round. Well, there is no need to worry, you have come to the right place. In this article we will discuss some lawn maintenance tips that will help maintain the beauty of your lawn. If you look at it carefully, lawn maintenance is not a difficult task. Although you can take of professional lawn care services. It is very simple to hire professionals, simply do a Google search. Say, if you live in Austin, type out lawn care Austin and you will get a good number of search results popping up on your screen. 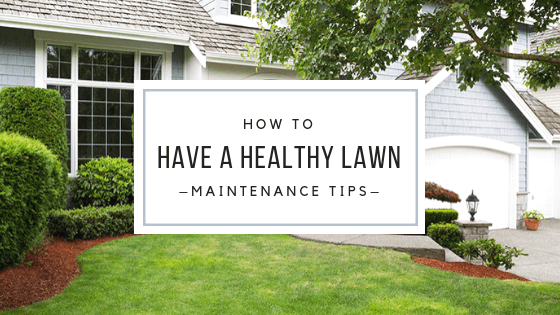 Nonetheless, without further ado let us dive into the lawn maintenance tips for a healthy lawn. These nettlesome outgrowths can very easily destroy your lawn, they block air and nutrients from reaching the grass and therefore prevent the growth of healthy grass. So the very first step is to remove them. Weeds in your garden can either grow as seeds or as flowers and the best option is to pull the weeds out from the roots. If there is a huge outgrowth than you might need to go for an herbicide. Mosses on the other hand grow in the areas of excess moisture and shady areas when sunlight do not reach. To remove the moss, first identify the underlying cause of its growing and then you can maintain its growth either by feeding or scarifying. With the poor drainage system, your lawn can be waterlogged for days on end which can be detrimental to your lawn’s health. The major causes of water build up in your lawn can be either due to the inability of soil to absorb water or the improper landscaping of the garden. Check out your soil’s permeability and if need be you can change the nature of your soil to achieve the required drainage level. The shape of your garden can also affect the logging of water. You can reshape your garden and remove any dips that can cause drainage problems. Your lawn needs aeration to allow proper penetration of water and nutrients into the soil to the root zone of the plants. Aeration is done by creating small holes in the soil at regular intervals through which air and nutrients can easily absorbed by the plant roots. You can treat small patches of your lawn individually or aerate your entire garden, though most gardens need to be aerated only once a few years. Mowing and edging at regular intervals is necessary to maintain the optimum health of your lawn. Mowing the yard is the best way to reduce the grasses length. The ideal mowing length is considered to be one third of the original length. A quick point to remember is that your lawn will need frequent mowing in the summer months as compared to the winters. Also you can maintain the edges and borders using edging shears after mowing to keep your yard grass healthy. There are various types of fertilizers available for gardening. It is recommended that you treat your garden at least twice every year to maintain the optimum health of your lawn and alongside feeding don’t forget watering your lawn regularly to keep the grass a healthy green colored all-round the year. Using the tips mentioned in this article you can maintain your lawn and keep it healthy looking throughout the year. Follow these tips regularly and you will be gifted with a healthy, lush and green lawn year round!